Manuscript: A-63(2) dated on the last page gecomp Aug 1908, geinstr. 1. Nov 19 Nov. 1908 / herzien 1-4 April 1910. The orchestrated version of Diepenbrock’s song Der Abend (The Evening) was performed for the first time on 14 April 1910 at a subscription concert in the Amsterdam Concertgebouw under the composer. Before the interval Diepenbrock conducted the Concertgebouw Orchestra in the Fourth Symphony by Gustav Mahler. After the interval the programme was entirely dedicated to his own works. Aaltje Noordewier-Reddingius was the soloist in Der Abend, Lied der Spinnerin (Song of the Spinner, RC 42) and Hymne an die Nacht “Gehoben ist der Stein” (Hymn to the Night “Uplifted is the Stone”, RC 49). The Hymne voor viool en orkest (Hymn for Violin and Orchestra, RC 44) was also performed. For this occasion Diepenbrock had revised the orchestration of the Hymne an die Nacht, and also that of the original version of Der Abend. A year and a half later he was proven wrong. 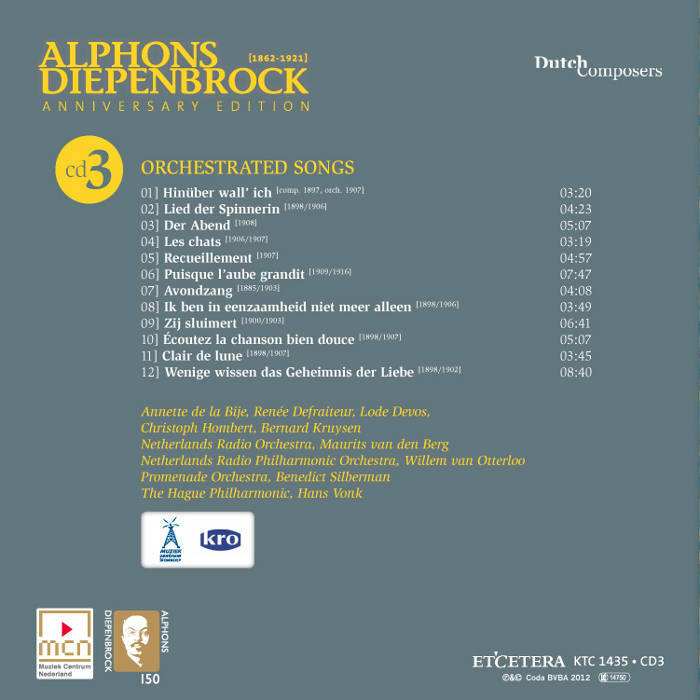 When revising the orchestration of Der Abend Diepenbrock discarded a great deal in order to make the music more transparent. This was not only influenced by the fact that during this period he was studying the symphonic and vocal works by Mahler, whom he admired ( Now I have all of Gustaaf’s songs, and I am more and more surprised by his immense genius , he wrote on 29 March 1910), as well as the music by Claude Debussy. For example, in 1909 Diepenbrock had made a piano score of Debussy’s Prélude à l’après-midi d’un faune (Prelude to the Afternoon of a Faun) for study purposes and in January 1910 he had purchased the score of Pelléas et Mélisande. Der Abend calls for a large wind section: besides Diepenbrock’s favourite duo of oboe d’amore and English horn, it includes 2 clarinets, bass clarinet and 4 horns, resulting in a wide variety of timbres. The horns present the opening motive, while the double basses reinforce the organ point. The woodwinds play solo most of the time, but in the interlude after the third verse (Più vivace, agitato molto) they join forces. 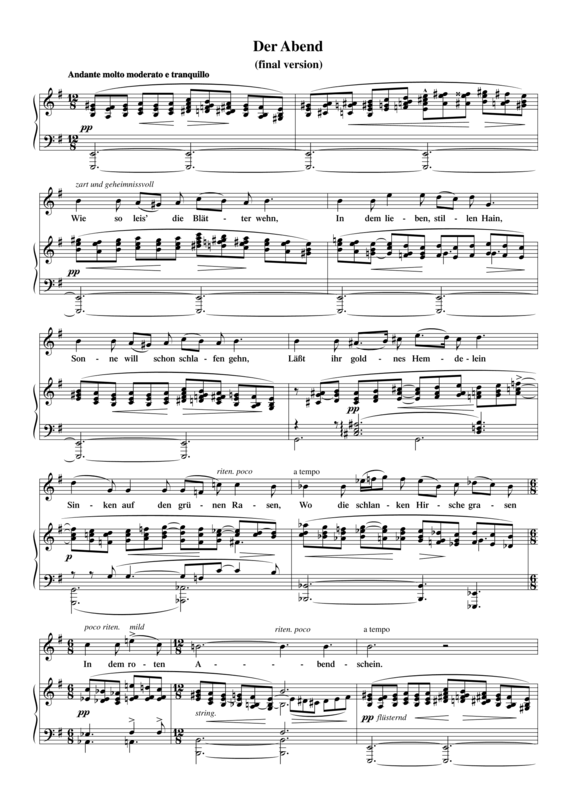 In the four measures after the peaceful end of that verse – on the words “ganz stumm” (quite silent) – Diepenbrock collectively makes the dynamics swell to fff, creating a much larger contrast with the preceding section than in the piano version. The sound is intensified even further by the clarinets playing Schalltrichter auf – an effect he derived from Mahler. A-63(2) dated on the last page gecomp Aug 1908, geinstr. 1. Nov 19 Nov. 1908 / herzien 1-4 April 1910. 14 apr 1910: Diepenbrock treedt op als gastdirigent op het abonnementsconcert. Het programma vermeldt voor de pauze de Vierde Symfonie van Mahler, na de pauze composities van Diepenbrock, en wel Lied der Spinnerin en Der Abend (eerste uitvoering), gezongen door Aaltje Noordewier-Reddingius, de Hymne voor viool en orkest, gespeeld door Julius Thornberg (eerste uitvoering) en de Hymne an die Nacht “Gehoben ist der Stein” (soliste Aaltje Noordewier-Reddingius). De heer Diepenbrock was gisteravond de dirigent. […] Mevrouw Noordewier en het orkest met zijn dirigent oogstten na de symphonie aller dank, maar de tweede helft van den avond bracht een groot en warm succes aan Diepenbrock, den toondichter: als componist van kleinere liederen, de Hymne voor viool en een der beide groote Hymnen an die Nacht (“Gehoben ist der Stein”) (Novalis); Brentano's Lied der Spinnerin, in de uiterst fijne en stemmingsvolle orkestratie, werd gevolgd door een ander lied van Brentano, Der Abend, waarin eveneens de suggestieve kracht der zelfstandige instrumentale stemmen naast den zang den indruk niet weinig verhoogde. […] Mevrouw Noordewier en het orkest zijn naar verdiensten gehuldigd, en Diepenbrock zelf kreeg een ovatie van langen duur en groote hartelijkheid!